﻿ Abbey Lamp is Going To Be Your Home Décor's Crush! Ella Family Is This Week’s Collection Trend! Best Deals: Discover The Most Beautiful Nickel and Black Lamps! Home Design Ideas: Office Décors You’ll Die For! Abbey Lamp is Going To Be Your Home Décor’s Crush! Abbey Lighting Family was presented at Maison et Objet Paris 2019, and today we’ll talk everything about it and how you can purchase it! Maison et Objet Paris is considered one of the top worldwide trade shows with more influence. The first edition of every year, during January, the new design trends are presented such as novelties and new products of the well known brands and emerging ones. DeligthFULL, in association with Essential Home, presented several new curate design pieces, and Abbey Lamp was one of them! Abbey Lamp was inspired by the jazz singer Anne Marie Wooldridge, as known as Abbey Lincoln. DeligthFULL’s design studio team couldn’t pass by her influence, so they put together a mid-century sophisticated lighting family, presented in Paris that is ready to conquer the world! Abbey Floor Lamp is one of the members and it is one mid-century lamp, ideal to pair up with vintage curate design pieces. You’ll create the perfect cocktail environment to stay in and enjoy family time! This floor lamp is considered a top choice when it comes to reading lamps. Are you envisioning yourself sit down in that marvelous mid-century armchair, while reading a nice book with the perfect direction and amount of light? Now, that is possible! Abbey Floor Lamp as perforating details on the top of the shade and this resemble us the mid-century era. Although this is clearly a mid-century floor lamp, it has a contemporary twist that will match any style décor! Abbey Lamp has two adjustable shades, so you can set into the desired position. It’s like having the opportunity to have a different lamp every single day, depending on your mood! This lamp, like all the others of the mid-century lighting brand, is handmade in brass and aluminum by talented artisans that still use ancient techniques to get these master pieces as a result! Abbey Floor Lamp is already available and it can be yours in a couple of weeks, so what are you waiting for? One big surprise is that Abbey Family has another member: the suspension version. A classic, and sophisticated chandelier with multiple shades that will be the center of attention of your home décor! We hope you liked our article! Feel free to pin all the images to your favorite Pinterest board or to print it and use then on your mood board. Don’t forget to explore our Twitter and Instagram for more Contemporary Lighting Ideas. Subscribe our newsletter and receive the best tips in your email box. Check out Covet NYC Facebook and Instagram accounts. 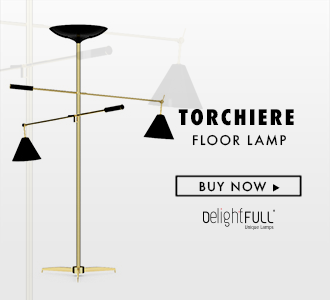 Celebrate DelightFULL’s 10th Anniversary With Us! Trend Of The Week: Turn Up The Quiet With Diana Family! Contemporary Moodboards With Contemporary Lighting! The Highlight of Your Contemporary Home Decor!